SANTA CRUZ, Calif. – Facebook followers of “Olive the Oiled Otter” received long-awaited news: Scientists spotted her with what they believe is her first pup. The birth of Olive’s pup is a milestone in oiled wildlife rehabilitation as this is the first pup born to a previously oiled sea otter in California. In early August, researchers from the Department of Fish and Game’s (DFG) Santa Cruz-based Marine Wildlife Veterinary Care and Research Center brought Olive into a mobile veterinary lab posted at the Santa Cruz Harbor for her first veterinary exam since her release. The team determined she was about half-term pregnant. She was given new flipper tags and released back to her capture site. “Olive,” who was estimated to be a year old at the time of her rescue in February 2009, earned her name during rehabilitation at the facility funded through DFG’s Office of Spill Prevention and Response (OSPR), when researchers used olive oil as part of the intensive bathing process. DFG scientists made a visual observation of Olive (without a pup) on Aug. 18, 2012, and then she took a short vacation from her normal resting area in Capitola, making her difficult to find for a few weeks. Her transmitter was heard back in Capitola on Sept. 7, 2012, and Olive was spotted swimming on her back clutching a newborn pup tightly to her chest. Initial observations indicate that Olive is an attentive mother, frequently grooming, nursing and holding her pup. DFG biologists will continue monitoring Olive and her pup at a safe distance to document her success in the wild while minimizing disturbance to the new family. DFG teams with the Monterey Bay Aquarium and the U.S. Geological Survey to study the ecology and population trends of the Southern Sea Otter, which is listed as a federally threatened species. 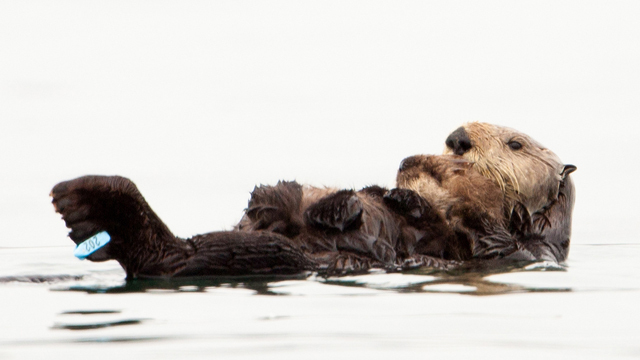 Results of the 2012 sea otter survey listed a population index of 2,792, which represents a very small increase in number and reverses the downward trend of the last few years. This month also marks the 10th anniversary of Sea Otter Awareness Week on Sept. 23 – 29, which provides the opportunity to educate the public about sea otters, their natural history and the conservation issues they face. The public also has the opportunity to donate to the Sea Otter Tax Check-off Fund to help fund sea otter research when filing in October for late and quarterly income tax. For information on Sea Otter Awareness Week, visit www.seaotters.org/soaw.html and for information on the Sea Otter Tax Check-off Fund visit www.dfg.ca.gov/taxcheck/. Additional information on Olive’s progress and photos are available at www.facebook.com/Olivetheoiledotter. General information on sea otter research is also available at www.dfg.ca.gov/ospr/Science/sea_otter_research.aspx.